Radio may seem like magic, but it's actually pretty easy to understand. AM/FM radio can feel like pure magic. When you switch on the radio, you can hear music, voice, or any other audio entertainment being broadcast from a source located hundreds – or even thousands – of miles away! However, radio reception is quite easy to understand once you demystify how radio waves are created and broadcast. You're probably familiar with AM, which stands for Amplitude Modulation, and FM, which stands for Frequency Modulation. Both AM and FM radio programs are transmitted over the air via radio waves, which are part of a broad range of electromagnetic waves that include: gamma rays, x-rays, ultraviolet rays, visible light, infrared, and microwave. Electromagnetic waves are all around us everywhere in different frequencies. Radio waves exhibit similar properties to that of light waves (e.g. reflection, polarization, diffraction, refraction), but exist at a frequency that our eyes are not sensitive to. Electromagnetic waves are generated by alternating current (AC), which is the electrical power used to run pretty much every appliance and/or technology in our homes and lives – from washing machines to televisions to our mobile devices. In the United States, alternating current operates at 120 volts at 60 Hz. This means that the current alternates (changes direction) in the wire 60 times per second. Other countries use 50 Hz as the standard. Although both 50 and 60 Hz are considered relatively low frequencies, the alternating currents still generate a basic level of electromagnetic radiation (EMR). This means that some of the electric energy escapes the wire and is transmitted into the air. The higher the frequency of the electricity, the more energy that manages to escape the wire out into open space. Thus, electromagnetic radiation can be loosely described as 'electricity in the air'. Electricity in the air is nothing but random noise. To be turned into useful signals that transmit information (music or voice) it must first be modulated, and modulation is the basis for AM and FM radio signals. That's how the terms AM and FM originated since AM stands for amplitude modulation and FM stands for frequency modulation. Another word for modulation is change. The electromagnetic radiation must be modulated or changed in order to be useful as a radio transmission. Without modulation, no information would be carried by a radio signal. Modulation is an easy concept to understand, especially since it's all around us. Our sense of vision is a good example to describe how modulation works. A blank piece of paper in your hand is useless until it becomes modulated or changed in some meaningful way. Someone would have to write or draw on the paper in order to communicate useful information. 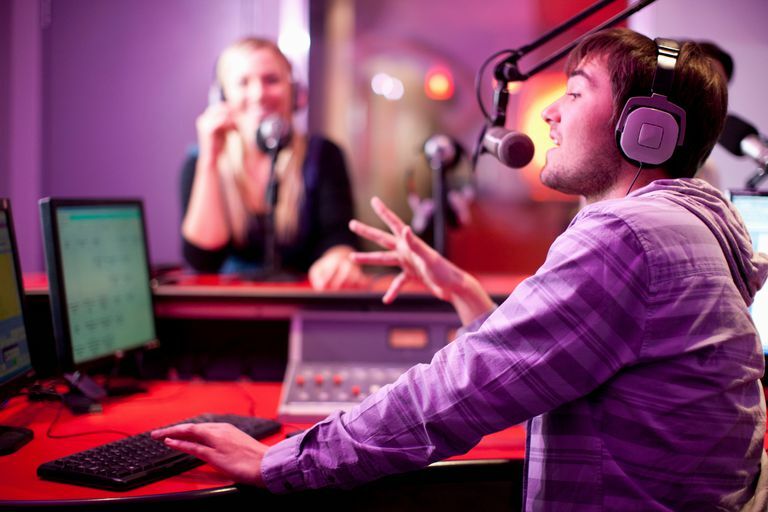 When it comes to radio broadcasts, the electromagnetic radiation (electricity in the air) must be modulated with the desired information to send. AM radio uses amplitude modulation and is the simplest form of radio broadcast. To understand amplitude modulation, consider a steady signal (or wave) broadcasting at 1000 kHz on the AM band. The amplitude (or height) of the constant signal is unchanged or un-modulated, thus containing no useful information. This steady signal produces only noise until it is modulated with information, such as voice or music. The combination of the two results in a change to the amplitude strength of the steady signal, which increases and decreases in direct proportion to the information. Only the amplitude changes, as the frequency remains constant the entire time. AM radio in the Americas operates in a range of frequencies from 520 kHz to 1710 kHz. Other countries and regions have different frequency ranges. The specific frequency is known as the carrier frequency, which is the vehicle by which the actual signal is carried from a broadcast antenna to a receiving tuner. AM radio has the advantages of transmitting over greater differences, having more stations in a given frequency range, and being easily picked up by receivers. However, AM signals are more susceptible to noise and static interference, such as during a thunderstorm. The electricity generated by lightning produces noise spikes that are picked up by AM tuners. AM radio also has a very limited audio range, from 200 Hz to 5 kHz, which limits its usefulness more towards talk radio and less for music. And when it comes to music, AM signals are of lower sound quality than FM. FM radio uses frequency modulation. To understand frequency modulation, consider a signal with a steady frequency and amplitude. The frequency of the signal is unchanged or un-modulated, so there's no useful information contained. But once information has been introduced to this signal, the combination results in a change to the frequency, which is directly proportional to the information. When the frequency is modulated between low and high, music or voice is being transmitted by the carrier frequency. But only the frequency changes as a result; the amplitude remains constant the entire time. FM radio operates in the range of 87.5 MHz to 108.0 MHz, which is a much higher range of frequencies than AM radio. The distance range for FM transmissions is more limited than AM – usually less than 100 miles. However, FM radio is better suited for music; the higher bandwidth range of 30 Hz to 15 kHz produces the sound quality we normally prefer to listen to and enjoy. But in order to have a greater area of coverage, FM transmissions require additional stations to carry signals further. FM broadcasts are also commonly done in stereo – a few AM stations are also able to broadcast stereo signals. And although FM signals are less susceptible to noise and interference, they can be limited by physical barriers (e.g. buildings, hills, etc. ), which impacts overall reception. This is why you can pick up certain radio stations more easily in some places than others, whether it's inside your home or around the city. Will TV Band Radios Work With Digital TV?